Christianity Explored: Why did Jesus Rise? I needed to renew my health insurance last month. I was offered up to 15% discount on my premiums if I completed an online interactive questionnaire about my health, my lifestyle, diet, and fitness regime. I wish I hadn’t. There were about 100 multi-choice questions. Things like, do you exercise regularly? One hour a day, two hours a day? Two hours a day? How far do you jog a day? Jog? One mile? Two miles? Are you serious? How much do you drink and how often? I thought that was a trick question because red wine is supposed to be good for you. A bottle a day is not as good as abstinence apparently. Do you smoke? Is there a history of cardiovascular problems, mental illness, diabetes, etc. in your family? Well we are all damaged good’s aren’t we? How much do you weigh? Truthfully or aspirationally? Before or after the full English breakfast? Do you eat saturated fats? Saturated fats apparently are things like spinach, carrots and Brussels sprouts, don’t go near them, they’ll kill you. What is your waist measurement? Well that depends doesn’t it? When I breath in or out? Then you factor in your height (without shoes), your marital status and age and then the programme will calculate your likely chances of needing medical treatment in the next ten years. A virtual doctor even gives you advice on improving your health and how to reduce your premiums still further. Staying healthy can become a full time occupation if you are not careful. It was depressing. I managed to squeeze 5% off my premiums with a few nods, winks and promises. After I finished the survey, I ate salads for a whole week with no French fries. I went to the gym twice and got to bed earlier. It nearly killed me. Fortunately it did not last. Life insurance companies, and even retirement homes, use something similar called the countdown calculator to work out how long clients are likely to live and therefore their liability. Premiums are adjusted accordingly. Whatever my insurance premiums next year, I know for a fact that, unless Jesus comes first, I will die one day. I don’t know if you realise but we all have a sexually transmitted disease. It is called life and the fatality rate is 100%. But because of what we read in Mark 16, the ultimate terror of death is removed. Our theme in this series entitled Christianity Explored is “The Resurrection : Why did Jesus Rise?” Let’s find some answers from Mark 16. Jesus Christ was dead and buried. And now it’s 36 hours later on the Sunday morning. Three grieving women who have cared for Jesus and looked after his needs, come to do what they imagine is the last loving thing they can do for Him. Sometime after dark the previous evening, when the Jewish Sabbath was over and the shops were open again they had gone and bought spices for his burial. They are up first thing the next morning, and make their way to the tomb. 15:47 tells is they knew where they were going because they had seen Jesus buried. Things couldn’t have been more dismal. A young life has been cut short. Jesus’ followers are in hiding, grieving. His killers are after them. There’s a real cause for fear. As they made their way to the grave they discussed how they would move the large stone that lay across the entrance to the tomb. So this was a grim morning. They experience grief at the loss of their dear friend, fear that His killers might come for them too, and powerlessness because of the stone. And in a sense these are the most common emotions in bereavement – grief, fear, powerlessness. That’s why the loss of a loved one is so dreadful. That’s how it was for the women because Jesus was dead and buried. Now, this is staggering! Do you see that if Christ has bodily risen from the dead, life can never be the same again. The certainty of His resurrection gives me future hope. The Bible says it means that his body is a prototype of the future bodies we’ll have. So we will all eventually die and our bodies will disintegrate. But because of the resurrection of Jesus, that is not the end of the story. Jesus had a new resurrection body and we trust we will too. That is why it is possible to have hope for the future in the face of death because Jesus resurrection demonstrates that death is not a dead end. It’s not the end of the story. It’s not the end of the journey. And I know that God has accepted the sacrifice of Jesus in my place because He has raised Jesus to life from that death He died for me. So the resurrection of Jesus to life proves to me that God has accepted His dreadful death in my place. That is why I now gratefully place my trust and life into the hands of the risen Lord Jesus. The resurrection also proves that forgiveness for my sin is in place and fully operational. Do you remember last week how we saw that Jesus was forsaken so that we need never be? Now how do I know that our sin was paid for? Answer: the Bible says that on the cross of Jesus God dealt with my sin. The resurrection of Jesus proves that God has accepted the death of Jesus in my place, and that I can share in his resurrection. The implications of this truth are not only earth shattering, they are literally life-changing. They flee from the tomb. And the word ‘flee’ there is the word used to escape a wild animal, they’re just shattered, they’re in shock. What would you do if you were chased by a bull? That’s what’s going on here. There’s at least two reasons why they are in shock. First, they arrive and they find that the stone has been removed. The word for rolled away is literally hurled out. Cosmic power has ripped the stone out. Its been flipped over and on one side. Second they’re shocked because they also there’s also no need for the spices that they’ve spent so much money on. You could say they were the original Spice Girls; Mary Magdalene, Mary the mother of James, and Salome. They’ve bought these expensive spices to express their love and devotion, but God has not only dealt with the large stone but also the dead body. Then to cap it, this young man dressed in white, says ‘ ‘Don’t be terrified, you’re looking for Jesus the Nazarene who was crucified.’ “Yes its true! Jesus, whose death was real and you saw it, was crucified, he was really buried here, see the place where they laid him, you are not imagining this, you’re not dreaming, it really happened. But it is not the end of the story. 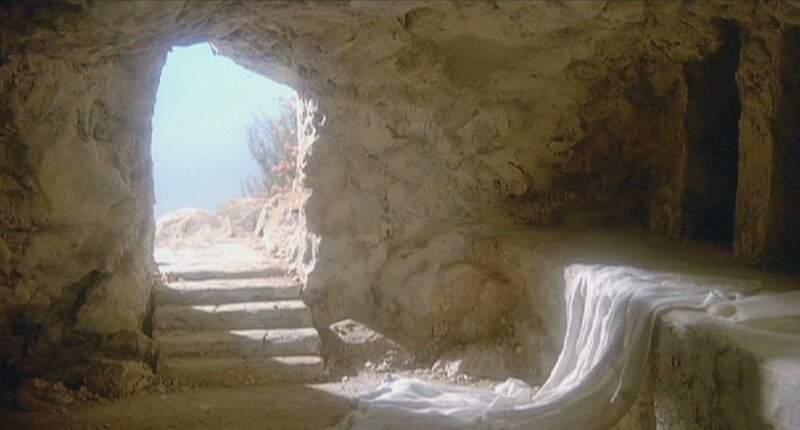 You can see the place, you can see the discarded grave clothes, but you won’t see him, He’s not here, He is risen.” Now, you might have encountered people who think that it is unnecessary to believe in the literal, physical resurrection of Jesus’ corpse to life. They refuse to believe what is beyond their personal experience. However, as we read Mark 16 we see that the idea of the resurrection did not sit easily with the early morning visitors to the tomb that day either. Bringing life to a three day old dead corpse is entirely beyond the realms of human reason and science. But we should not reject the resurrection of the dead on the grounds we can’t do it. It is a mind-blowing truth that we are being told about here in Mark 16. And Mark does not soft sell the honest reality of their response. Mark shows us the incredulity of the women. He in no way down-plays their struggle to comprehend what they are being told about Jesus. He doesn’t tell a story of the women finding and embalming the body wrapped in the linen Joseph had bought, and going home for coffee, and comforting each other by the thought that Jesus is kind of alive and still with us. And pledging themselves to keep His memory alive even though they know His body was really decomposing in a tomb. No, Mark is unafraid to show us a very understandable human reaction to a staggering claim; that the dead can live. The women didn’t think the man in white gave them a metaphor, he nearly gave them a heart-attack! They were terrified. I want you to see that the Christian gospel is completely intolerant of make-believe. We are not told to make of it what we will, we are given the information to trust in for our lives and our deaths. The Bible does not let us reduce the staggering wonder of Jesus resurrection to a mere metaphor. Because when I come to die, death will not be a metaphor, it will be flesh and blood real. And I will need something more that a word-picture to get me through that. Which is why the flesh and blood death, burial and resurrection of Jesus is so gloriously life-and-death-changing. Jesus was dead and buried. Now he is alive and well. Look again at Mark 16:6*. “… see the place where they laid Him.” . But let me remind you of the catalogue of things that were done to Jesus earlier. They had betrayed Him, rejected Him, mocked Him, spat on Him, flogged Him, and killed Him. All of the things that were done to Jesus reveal the verdict of the people who did them, on Him. He was worthless to them, they attached no value to His life. What a picture this is of the sovereign power of King Jesus. The messenger from heaven reminds them of what Jesus had said “three days later I will rise!” Who else could be in such control of every aspect of his own death and resurrection? He had told His disciples He needed to borrow a colt to travel into Jerusalem on in 11:3, and a large room for His last meal with His disciples in 14:14, and we know that Joseph loaned Him a tomb. When we put all these together it is almost as though Jesus had been saying to His followers “we are going to have a really tough time, I need a colt for a few hours and a room for an evening, you will see me die and I will need to borrow a tomb for three days, but I am rising on Sunday, and we will all meet up for lunch in Galilee on Monday as planned.” Anyone could say these words, but only a King of staggering sovereign power could make them happen! The resurrection of Jesus proves that God has accepted His death for my sin as full and final payment. The resurrection reverses the world’s verdict on Jesus and shows that He is God’s exalted Son and King – who never ceased to reign in sovereign control, even as He was being rejected by the Jews, abandoned by the disciples, brutalised by the Romans and forsaken by God on the cross as He paid for my sin. And finally, the reality of the resurrection is proven by the vitality of the Christian church today. One thing is certain; if Jesus did not rise from the dead we would never have heard of him. These women had come to pay their last loving tribute to a dead body, they’ve come to anoint a corpse, it’s over, we’re done. Peter, who had betrayed Jesus and the others think that they will eventually go back to fishing and pick up their lives, it’s agony. They thought Christ was dead and their hopes shattered. But now those three words ‘He has risen’ change everything. They are the words upon which the Christian faith is built. They brought the Christian church into existence. Jesus was dead and buried. He is alive and well. He is risen and reigning. So..
What a privilege God gave the women. What a comfort these words would have been to the first readers of this gospel, and every generation since who have suffered for their faith in Christ. How good to know, that He has literally gone ahead of us. He knows what it is to suffer, to die and to rise. Those who follow him will surely suffer and die too. But we will certainly rise also. The grave is held open by Jesus for those who are His. And just as the disciples were told they would see Jesus, so the Bible tells us that this will be true for everyone who has ever lived. Jesus is the risen, reigning King and Saviour. Planet earth is sustained by Him, and has not seen the last of Him. Now, we can see how utterly and uncompromisingly honest Mark is in his record of what happened that day. Truth is always stranger than fiction. What happened after this momentous angelic appearance? After these women received such wonderful news? This awesome privilege of being the first to share the good news of Christ’s resurrection? So Christ’s resurrection not only brings hope, because He is risen and reigning, it also promises that He has the right and power to raise us and judge us. Last week I showed you the DVD of my entire life. Imagine this DVD contains your whole life, every deed, word and thought – unedited. We know there’s loads that’s brilliant on it from loving relationships, kindness, generosity, fulfilment of gifts and abilities, loads of good stuff. There’s also much of which we’re utterly ashamed. But we may think we’re through with the past and we can forget it. But the resurrection says we’re not through with the past because the past is not through with us – because God will raise us one day – on the day of reckoning. How can it be any other way? He is our Creator, and He has stepped into history to be our rescuer from sin. He has given His life so that those who trust in Him can be forgiven and put right with God. And now says there will come a day when history will be judged. He will one day soon return to this world, which is still in rebellion against Him, and he will end that rebellion. Why does Peter get a specific mention? Why is he singled out? Peter had been the one who rebuked Jesus for suggesting he would be crucified in Mark 8. Then after his arrest, Peter had denied even knowing Jesus, not once but three times in Mark 14 just as Jesus had predicted. But notice how after his failure the risen Lord Jesus sends a personal message to Peter. Max Lucado paraphrases the message like this: “Be sure and tell Peter he’s not left out… one failure doesn’t make him a flop”… Not many second chances in the world today… This world is ruthless and unforgiving “Around here we don’t tolerate incompetence” or “Not much room at the top” or “Three strikes and you’re out” or “It’s a dog-eat-dog-world”. To all this Jesus has a simple answer… “Be sure to tell Peter he gets to bat again.” It’s not every day you get a second chance. Peter must have known that. The next time he saw Jesus he got so excited that he jumped into the Sea of Galilee! It was also enough to cause this backwoods Galilean to carry the gospel of the second chance to Rome where they killed him. If you’ve ever wondered what would make a man willing to be crucified upside down, maybe now you know. It’s not every day you find someone who’ll give you a second chance – much less someone who’ll give you a second chance every day. In Jesus we find both. Jesus had not come to be served – which is just as well – He had given His life as a ransom. For Peter, for you, for me. The joy of the resurrection is that though we have made a complete mess of our relationship with the Lord, through our selfish motives, He did go to the cross, He paid for that sin, and He lives to forgive those who trust in Him. So this is the message that everyone of us needs to hear – Jesus is alive. You are going to meet Him, just as He said. But you can, and must meet Him before then, by faith. As you thank Him for dying for you, ask His forgiveness for your sin, and place your life in His hands. Then you can go through life with no fear of death or fear of judgement because He faced it for you. Often on TV adverts a voice will inform us that “operators are standing by to take your call.” This is no cheap advert, but I close by saying, the risen Lord Jesus is able to hear you if you will call to Him today. Adapted with thanks from the Christianity Explored course. This entry was posted in Sermons, Theology on November 27, 2011 by Stephen Sizer.